"Neptuned" the opposition, anagram of Pete Dunn. Neptune being the Roman God of the Sea. 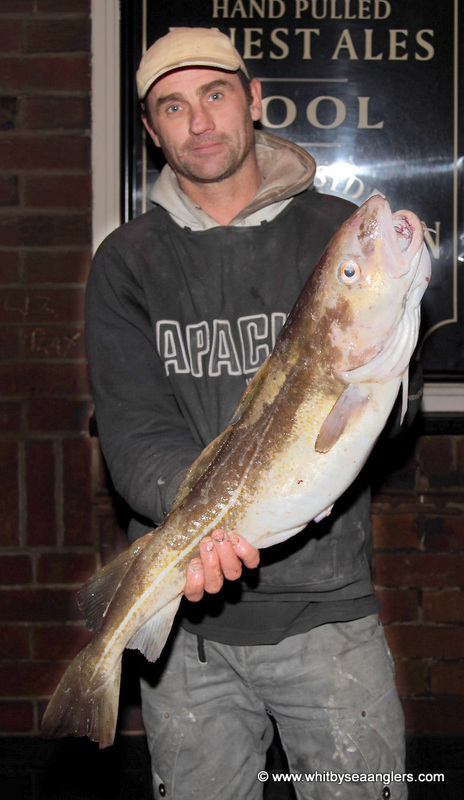 Pete Dunn WSAA Annual Open Winner 2012, with this 12 lb 00 oz cod. Photograph by Richard Saltmarsh. Low water 1300 hrs 1.4m. Fishing from 1000 – 1600 hrs. Low water was at 1300 hrs at a height of 1.4m. Conditions were far from favourable with bright clear skies, some colour in the water and little to no swell. With a gentle southerly wind, 103 seniors and 3 junior anglers, embarked on a scratching match knowing that just one fish would get them to the prize table. With £500 for 1st, £300 for 2nd and £200 for 3rd places, thereafter, there was a remarkable list of prizes from our generous sponsors, a full list can be found below. Value of prizes awarded, including cash, vouchers and goods, came to over £2,000. 27 seniors and 1 junior were at the scales to weigh in 44 fish for 92 lb 14 oz. Of those 44 fish, 15 were wrasse, 4 flat fish, 1 pollack, 3 coal fish and 21 cod. Congratulations also to Ian Thompson, from Scarborough, 2nd place with 4 fish for 8 lb 02 ½ oz. Congratulations also to Gary Pye, from Peterlee, who had the second heaviest fish, a pollack of 4 lb 14 ½ oz and 3rd overall with 2 fish for 6 lb 11 oz. Congratulations to J Sayer, the Junior winner, who won £50 with a flat fish of 08 oz. 17th £50 sponsored by Java Café won by J Nixon, from Redcar. £20 for smallest fish by weight sponsored by James Verrill won WSAA member Mike Bowman, from Liverton Mines. Many thanks to WSAA members, Bernard Vasey, James Gilpin and Andrew Cass for overseeing the weigh in, Colin Stainthorpe for selling the raffle tickets, treasurer Dave Perrett and Chairman William Atkinson for representing WSAA sponsors at the prize table. Many thanks to WSAA photographer Richard Saltmarsh. As reported by Peter Horbury 19th November 2012. Sponsors of the 2012 Open.